The De Havilland Dash-8-400 Turboprop is currently commercially called the Bombardier Q400 turboprop. In 1992 Bombardier acquired De Havilland Canada from Boeing and launched the De Havilland Dash-8-400 Turboprop in 1998 under the De Havilland Dash-8 Series turboprops. Bombardier has been marketing the De Havilland Dash-8-400 Turboprop as the Bombardier Q400 Turboprop. 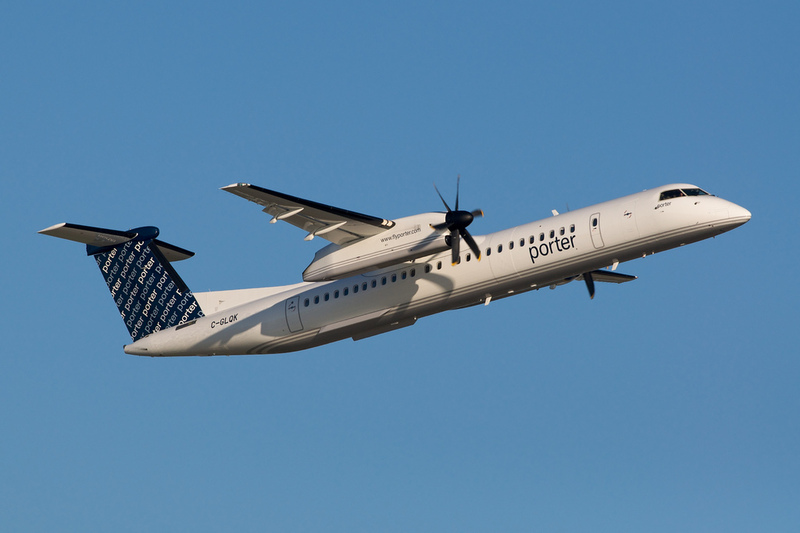 Recently Bombardier has made changes to the De Havilland Dash-8-400 Turboprop's type certificate to change the manufacturer name to Bombardier. The certificates in the FAA database now read Bombardier Dash-8-400 or more specifically Bombardier DHC-8-400. Above De Havilland Dash-8-400 Turboprop Photo by BriYYZ on Flickr. Photo (Only) released under a Creative Commons License. The De Havilland Dash-8-400 Turboprop is currently built at the Toronto Downsview airport at Bombardier's facilities in Canada. The De Havilland Dash-8-400 Turboprop engines are powered by the Pratt & Whitney Canada PW150A engine. The De Havilland Dash-8-400 engine PW150A is specifically made for the De Havilland Dash-8-400 Turboprop and is not used on any other aircraft. To view an overview of the De Havilland Dash-8-400 Turboprop visit the Bombardier Q400 Information page. The De Havilland Dash-8-400 Interior has recently been upgraded by Bombardier as part of the Bombardier Q400 Nextgen or De Havilland Dash-8-400 Nextgen turboprop. To learn more about the interior visit the Bombardier Q400 Interior page. The De Havilland Dash-8-400 safety record has been very good worldwide. To learn more about the De Havilland Dash-8-400 turboprop safety record visit our Bombardier Q400 Safety Record page, which has detailed information on the De Havilland Dash-8-400 Turboprop Safety Record. The De Havilland Dash-8-400 price is in the $20 million Dollar (USD) range. To get the full details on the De Havilland Dash-8-400 Turboprop price visit our Bombardier Q400 Price page. There are 32 De Havilland Dash-8-400 operators worldwide as of October 2, 2011. To see all of the De Havilland Dash-8-400 Turboprop Operators visit our Bombardier Q400 Operators page, which has a list of all the operators of the De Havilland Dash-8-400. To see all the De Havilland Dash-8-400 seating plans of the various airlines that operate the De Havilland Dash-8-400 turboprop visit our Bombardier Q400 Seating Plan page. To see the De Havilland Dash-8-400 seat map, seating chart and seating configuration visit our Bombardier Q400 Seat Map - Seating Chart page. Here on FlyRadius you can learn about the De Havilland Dash-8-400 landing gear. To get the full details on the De Havilland Dash-8-400 Turboprop landing gear visit our Bombardier Q400 Landing Gear page. This page has detailed information on the operation of the De Havilland Dash-8-400 landing gear and some of the De Havilland Dash-8-400 turboprop landing gear problems. The De Havilland Dash-8-400 propeller is the Dowty R408 a six blade propeller built by Dowty a GE Aviation company. To learn more about the De Havilland Dash-8-400 Turboprop propeller visit our Bombardier Q400 Propeller - Dowty R408 page, which has the specifications, dimensions and details on the De Havilland Dash-8-400 Turboprop Propellers. The De Havilland Dash-8-400 Cockpit - Flight Deck has 5 LCD screens displaying all the avionics information. To get the full details on the De Havilland Dash-8-400 turboprop Cockpit and Flight Deck visit the Bombardier Q400 Cockpit - Flight Deck page. The De Havilland Dash-8-400 range is around 1,756 sm (Statute Miles) depending on the configuration of the De Havilland Dash-8-400 aircraft. To learn about the full details on the De Havilland Dash-8-400 turboprop range go to the Bombardier Q400 Range page on our site. The De Havilland Dash-8-400 type rating is offered by many companies worldwide, with FlightSafety International being the main provider of the De Havilland Dash-8-400 type rating. To get the full facts on the De Havilland Dash-8-400 turboprop type rating go to the Bombardier Q400 type rating page. To learn all about the De Havilland Dash-8-400 turboprop use the Bombardier Q400 Information pages because the De Havilland Dash-8-400 turboprop is actually the Bombardier Q400.